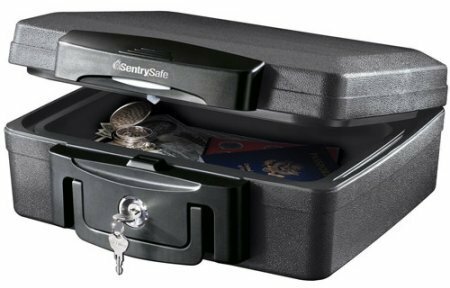 The Top Opening Biometric Drawer Safe allows you to keep firearms, valuables and important items close at hand and easily accessible. When the contents must be accessed, the state of the art locking mechanism is opened through the high-tech fingerprint recognition. 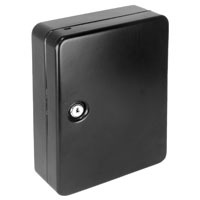 The owner of the biometric gun safe can record up to 30 different fingerprints that open the lock. Valuable contents are protected from thieves and keeps firearms and weapons safely out of children's reach yet keep them accessible in seconds. 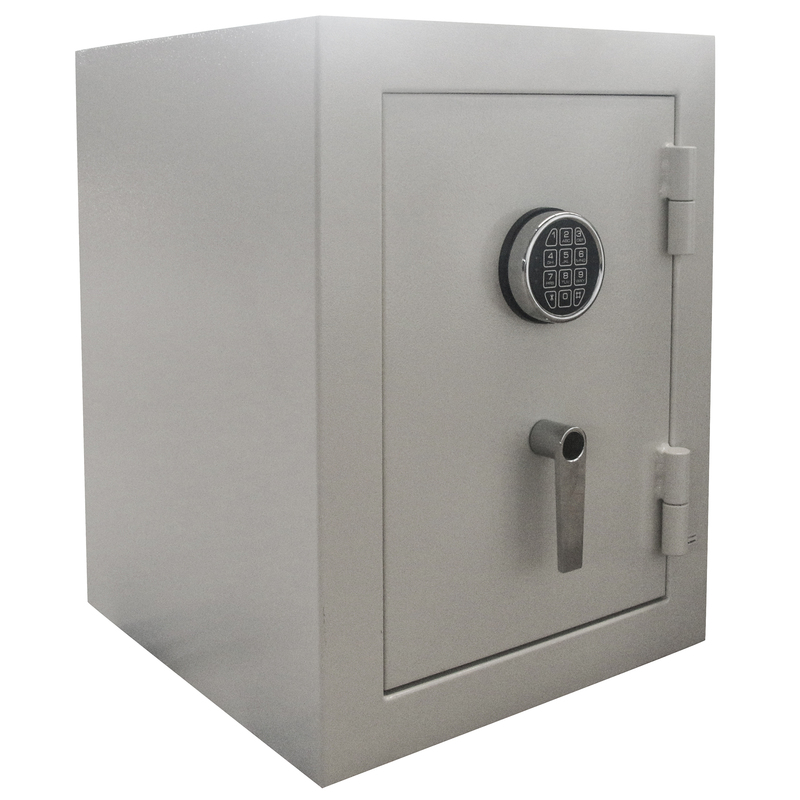 With this safe there is no more need for finding the right key or remembering a complex numeric combination under duress. The faceplate removes to reveal a backup key lock in case of battery failure. 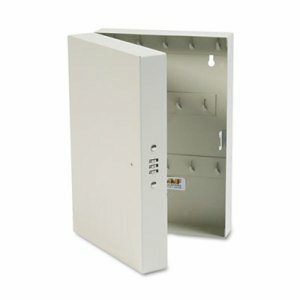 Pre-drilled holes allow the safe to be mounted into the floor, on a shelf or counter top. A protective mat is included ensuring that items are not scratched. 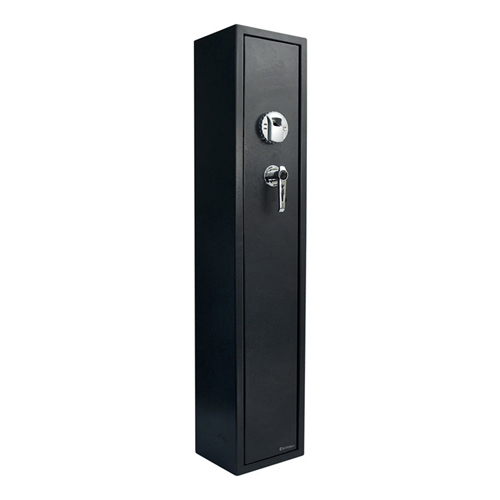 The Barska Large Biometric Safe dimensions allows for storage of multiple items such as electronics, important documents, jewelry, small firearms, and much more. This technology is a must have for your home or for office security. 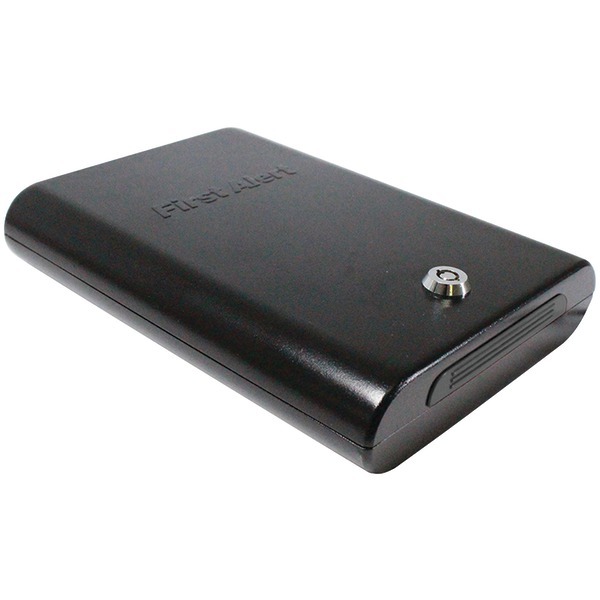 Has the ability to store up to 120 fingerprints, allowing access for multiple users. Like all Barska Biometric Safes, you can depend on the biometric technology to give you the ability to quickly access your belongings in seconds. The three point solid dead bolt locking system can be quickly opened in seconds with a turn of the steel handle. A silent access feature that allows you to mute beeping notification. Pre-drilled holes allows the safe to be mounted into the floor, on a shelf or counter top. 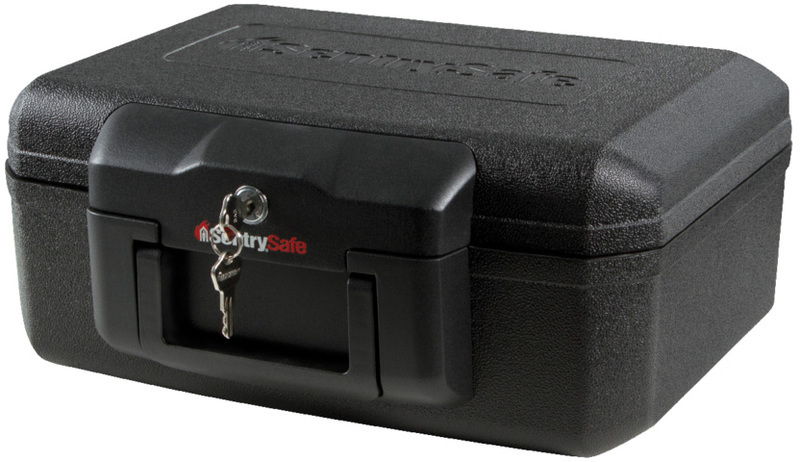 The safe is the perfect storage solution for small electronics, firearms, jewelry, medicines, and important documents. Backed by a One Year Limited Warranty. Includes protective floor mat, one removable shelf, external battery pack, four AA batteries, set of emergency back-up keys and mounting hardware. 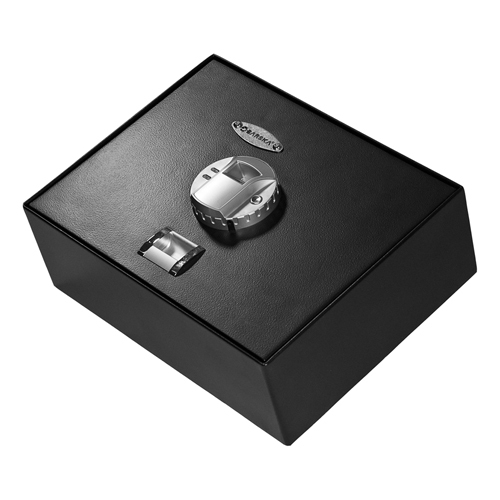 The Top Opening Biometric Drawer Safe allows you to keep firearms, valuables and important items close at hand and easily accessible. When the contents must be accessed, the state of the art locking mechanism is opened through the high-tech fingerprint recognition. 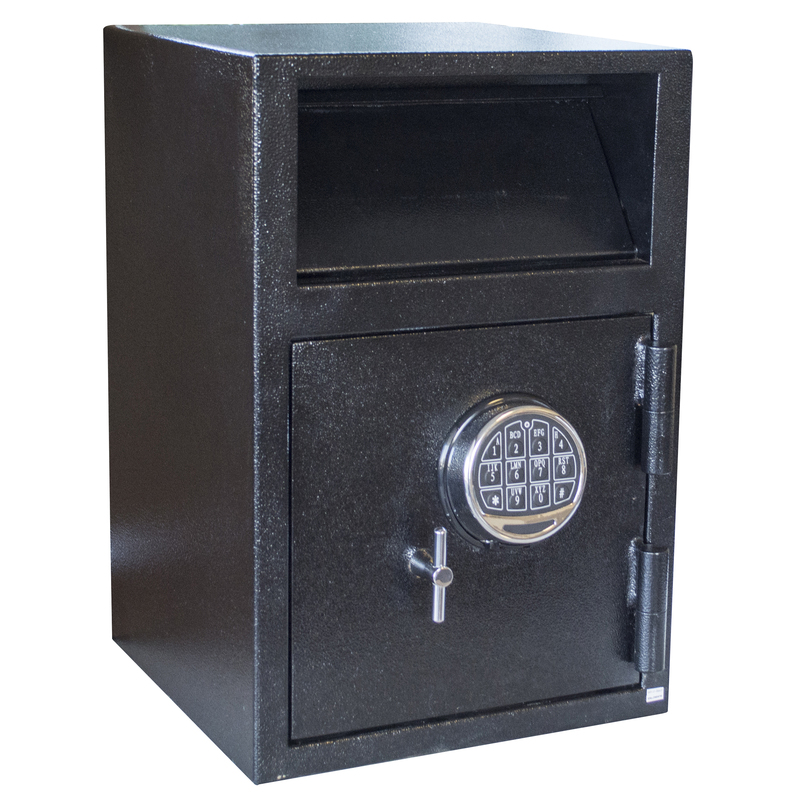 The owner of the biometric gun safe can record up to 30 different fingerprints that open the lock. Valuable contents are protected from thieves and keeps firearms and weapons safely out of children's reach yet keep them accessible in seconds. 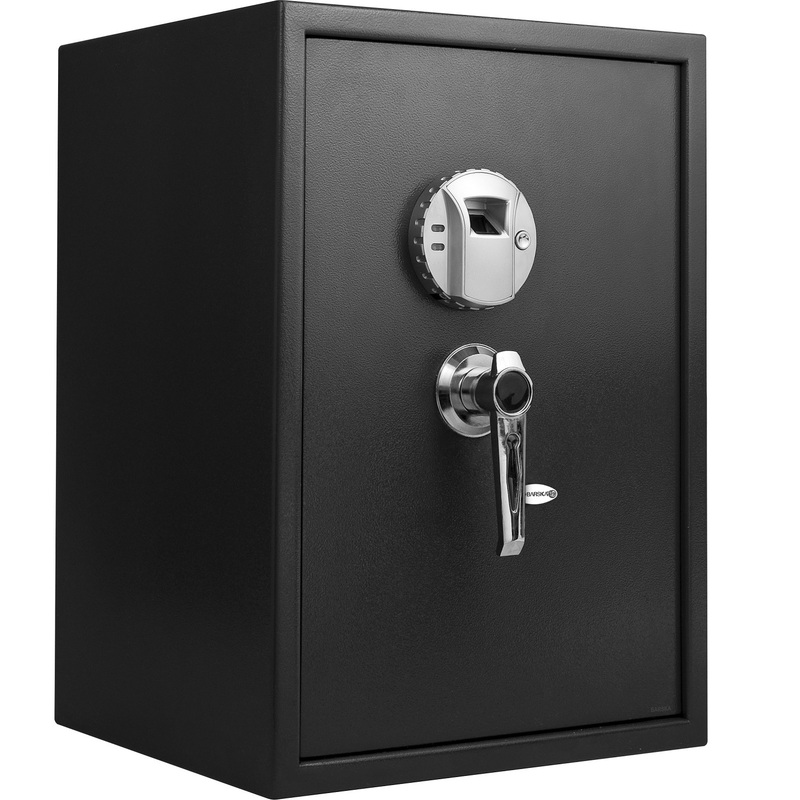 With this safe there is no more need for finding the right key or remembering a complex numeric combination under duress. The faceplate removes to reveal a backup key lock in case of battery failure. 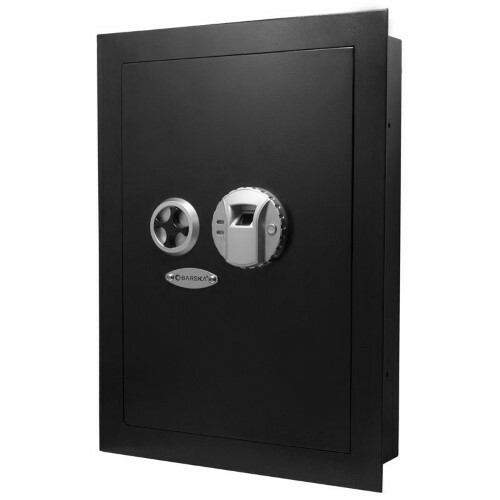 The safe features a dual hydraulic hinge allows for quick secure access to your valuables. Pre-drilled holes allow the safe to be mounted into the floor, on a shelf or counter top. A protective mat is included ensuring that items are not scratched. 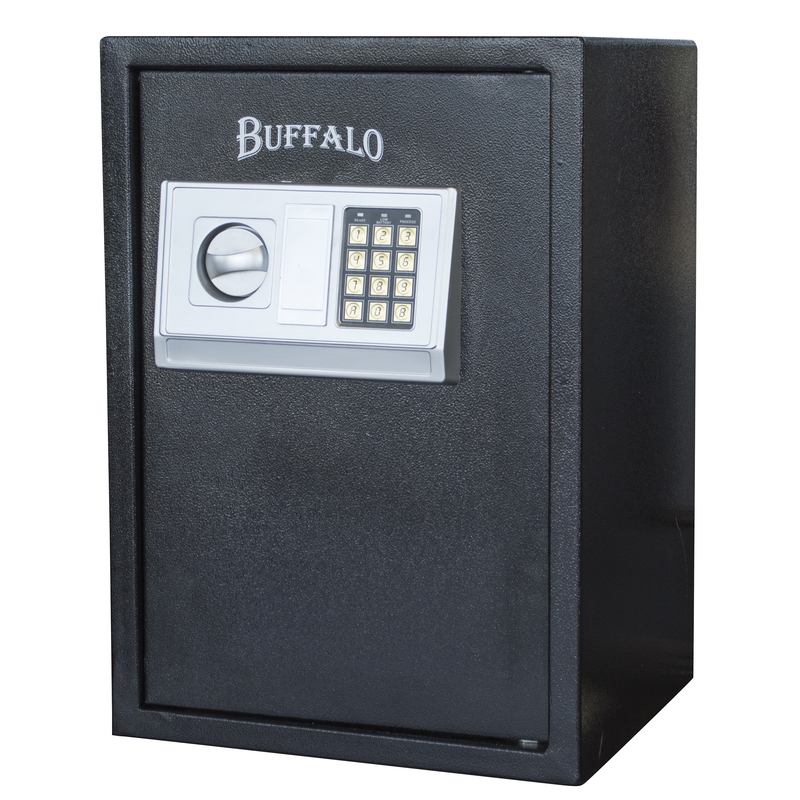 Keep your money and sensitive documents safe from theft with the Buffalo Deposit Drop Safe with Electronic Lock. 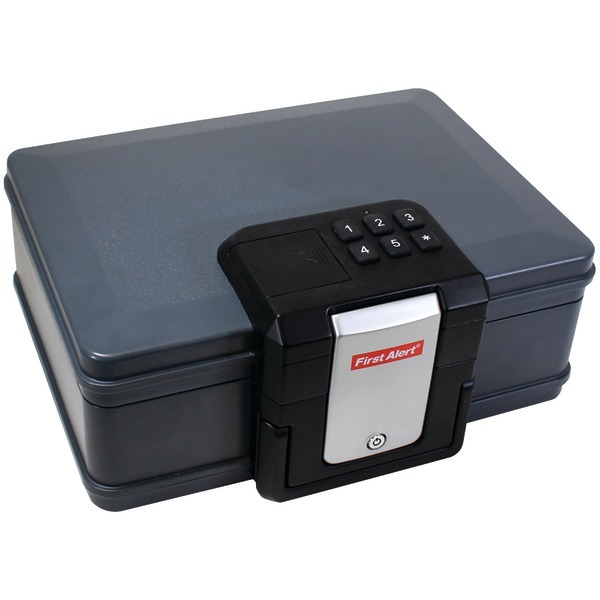 Ideal for businesses dealing with lots of cash transitions or that handle sensitive information, the Drop Box Floor Safe can accommodate full sheet envelopes and deposit pouches, so you can secure money and valuable data quickly and easily. Program the electronic keypad with your own 6 digit combination. The keypad also features a 5 minute time out for 3 incorrect code entries. Bolt down the 14 gauge steel safe through the pre-drilled holes on the bottom with the included hardware. Two 3/4 inch live locking bolts secure the 10 mm steel door. Not fire rated. The Dupli-Key system utilizes two different sets of numbered key tags. Attach your master keys to the red octagonal-shaped self-locking key tag and fasten duplicate loaner keys to white oval-shaped, snap-hook key ring. When a loaner key is issued, insert a receipt slip in the brass holder and place on hook. Keep track of all vital key information in the Cross Reference Index Kit included. Key Capacity: 60; Material(s): Welded Steel; Color(s): Sand; Width: 14". The Dupli-Key system utilizes two different sets of numbered key tags. Attach your master keys to the red octagonal-shaped self-locking key tag and fasten duplicate loaner keys to white oval-shaped, snap-hook key ring. When a loaner key is issued, insert a receipt slip in the brass holder and place on hook. Keep track of all vital key information in the Cross Reference Index Kit included. Key Capacity: 90; Material(s): Welded Steel; Color(s): Sand; Width: 14". 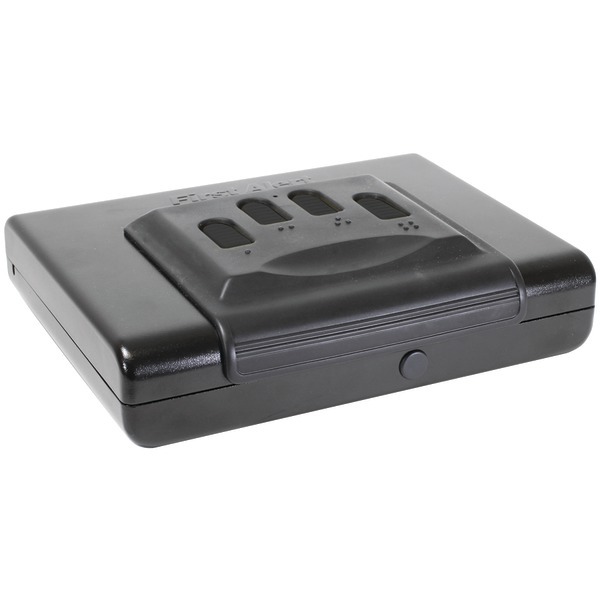 Keep your valuables safe and protected with the Buffalo Electronic Floor Safe with Keypad. 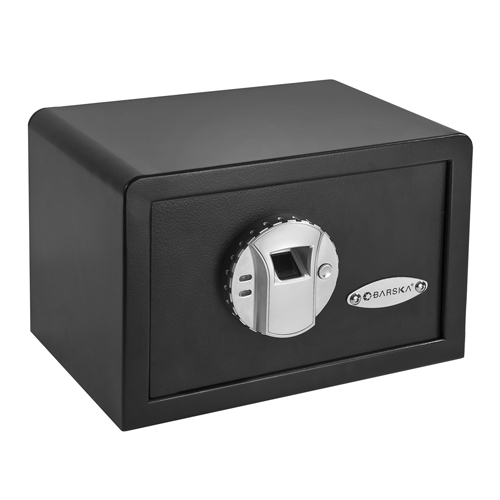 The generous 1.75 cubic feet interior can hold your coin collection, jewelry, important files, cash, valuables and other collectables. Program the electronic keypad with your own 3 to 8 digit combination, while 2 keys provide extra backup protection. Bolt down the 6mm steel safe through the pre-drilled holes on the bottom and back with the included hardware. Three 20mm locking bolts secure the 3mm steel door. 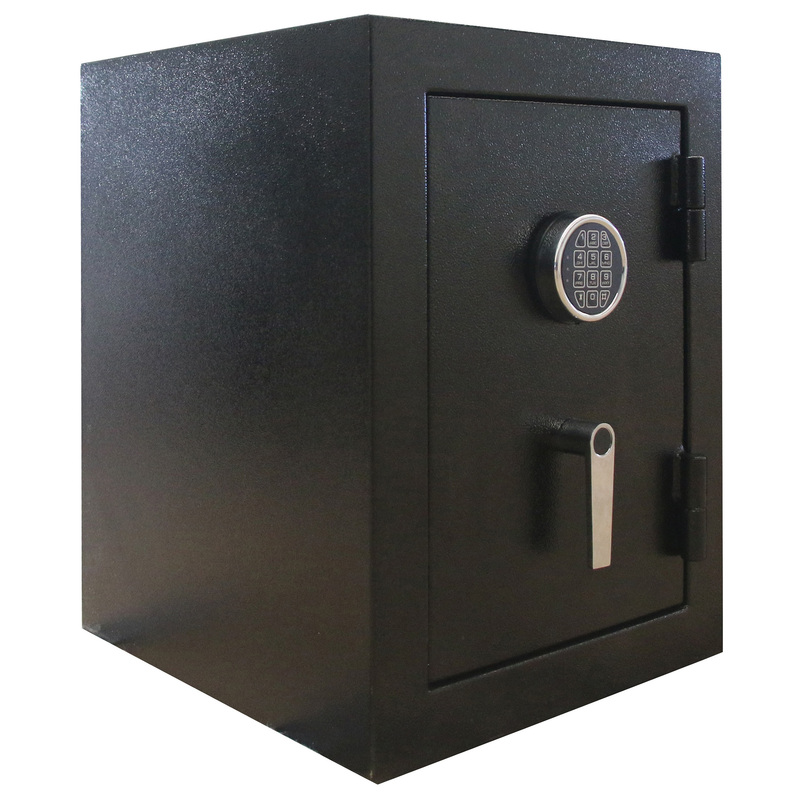 Inside the safe contains one removable internal shelf plus a protective felt floor mat to keep your possessions from sliding around or rubbing against the metal surface. Not fire rated. 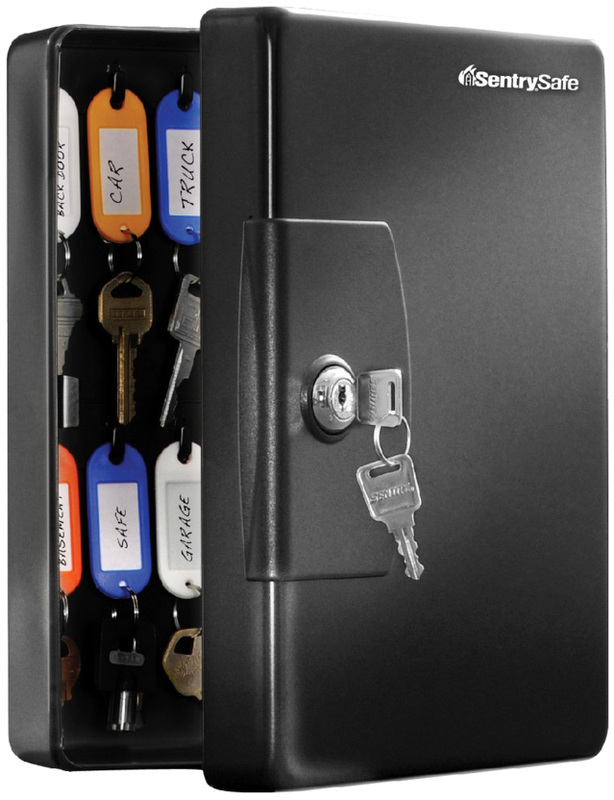 Key cabinet with electronic locking device adds higher security to protect important keys. Made of welded heavy-gauge steel with full piano hinges. Interior holds numbered, writable white key tags with chrome-plated steel hooks. 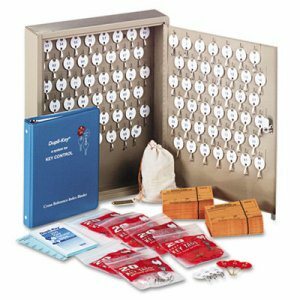 Includes a key control chart to record lock and key location. Yellow key loaned tags are included to identify your current users of secured keys. Door handle features an easy-open lock. Electronic locks provide up to eight number keypad codes for enhanced security. Three wrong entries result in an alarm and automatic lockout. Offers two manual override keys for emergency opening. 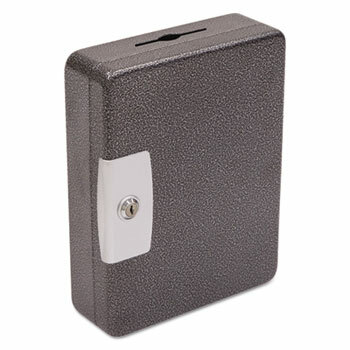 Features a low-battery indicator and rich scratch-resistant, silver vein powder-coated enamel. 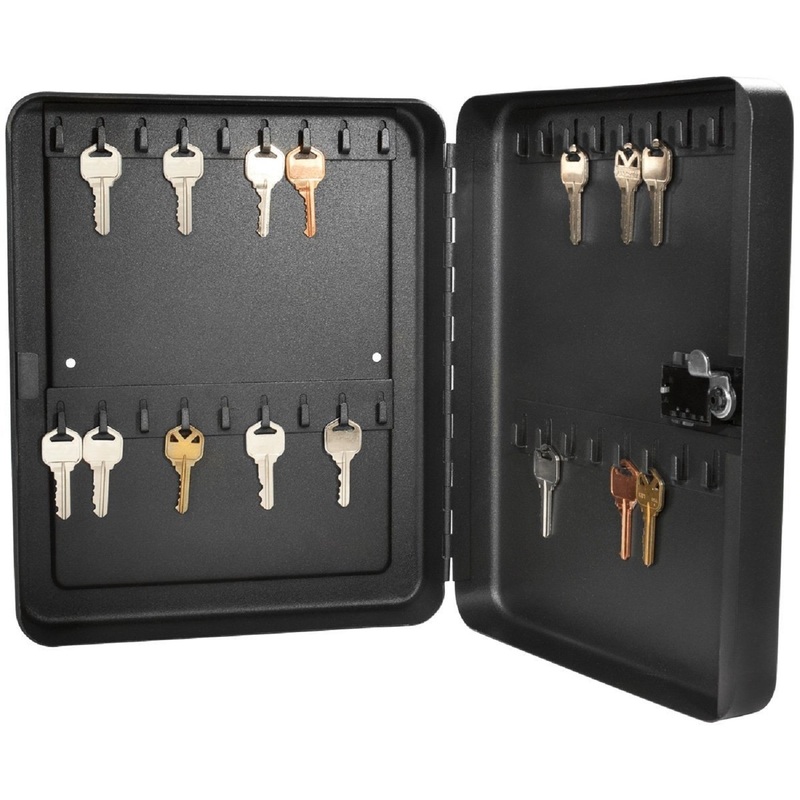 Electronic key cabinet includes four AA batteries. Key Capacity: 120; Material(s): Steel; Color(s): Silver Vein; Width: 14 3/4". 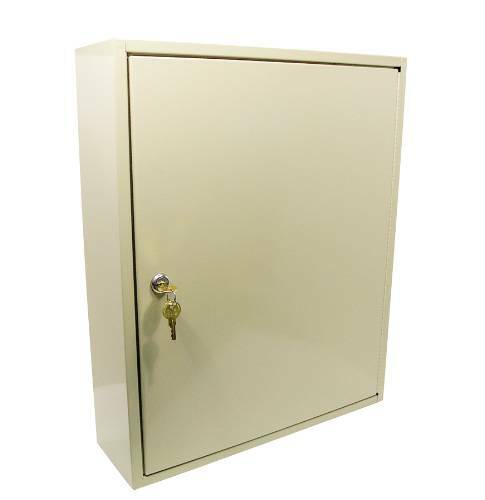 Key cabinet with electronic locking device adds higher security to protect important keys. Made of welded heavy-gauge steel with full piano hinges. Interior holds numbered, writable white key tags with chrome-plated steel hooks. Includes a key control chart to record lock and key location. Yellow key loaned tags are included to identify your current users of secured keys. Door handle features an easy-open lock. Electronic locks provide up to eight number keypad codes for enhanced security. Three wrong entries result in an alarm and automatic lockout. Offers two manual override keys for emergency opening. Features a low-battery indicator and rich scratch-resistant, silver vein powder-coated enamel. 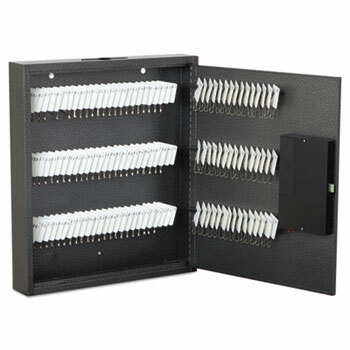 Electronic key cabinet includes four AA batteries. Key Capacity: 30; Material(s): Steel; Color(s): Silver Vein; Width: 9 7/8". 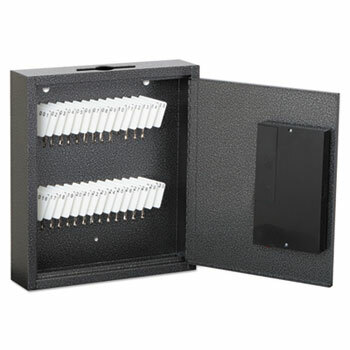 Key cabinet with electronic locking device adds higher security to protect important keys. Made of welded heavy-gauge steel with full piano hinges. Interior holds numbered, writable white key tags with chrome-plated steel hooks. Includes a key control chart to record lock and key location. Yellow key loaned tags are included to identify your current users of secured keys. Door handle features an easy-open lock. Electronic locks provide up to eight number keypad codes for enhanced security. Three wrong entries result in an alarm and automatic lockout. Offers two manual override keys for emergency opening. Features a low-battery indicator and rich scratch-resistant, silver vein powder-coated enamel. 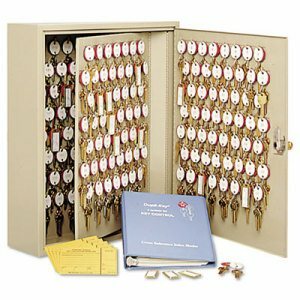 Electronic key cabinet includes four AA batteries. Key Capacity: 60; Material(s): Steel; Color(s): Silver Vein; Width: 13". Made of heavy-gauge steel designed with a unique, drawn-formed seamless body and a lock that resists prying or tampering. Unique key-drop slot is perfect for after-hours security. Cabinet doors are fitted with a convenient door plate for easy opening and closing. Key rings and hook-style, black key tags with plastic-protected writing surfaces are provided to store and organize your keys. Two-tone design includes a rich, scratch-resistant, Silver Vein, powder-coat enamel. 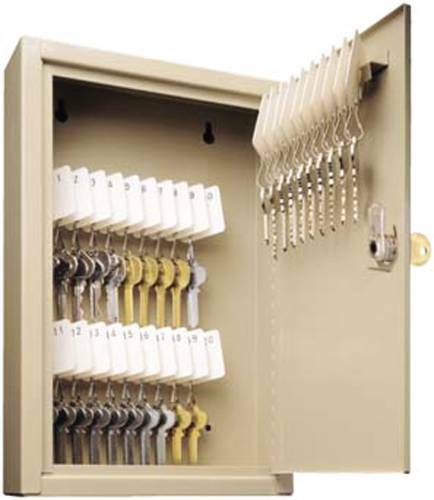 Cabinet also includes two keys to lock and unlock the cabinet. Key Capacity: 100; Material(s): Steel; Color(s): Silver Vein; Width: 9". Durable heavy-gauge steel construction with scratch and chip-resistant finish. Versatile key hooks allow you to hang 28 keys with or without key tags. Full-length piano hinge and sturdy handle make opening and closing a breeze. Door-mounted combination lock. Predrilled holes allow for hanging on wall or attachment to partition hanger (screws included). Key Capacity: 28; Material(s): Steel; Color(s): Putty; Width: 7 3/4". 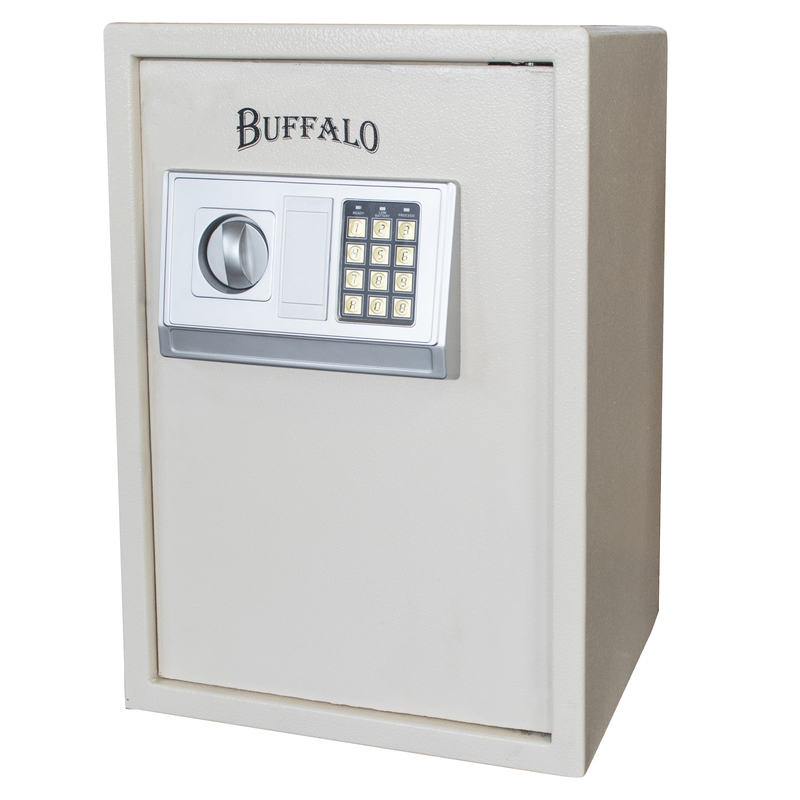 Keep your jewelry and valuable collectables protected from theft and fire with the Buffalo Jewelry Safe with Electronic Keypad Lock. 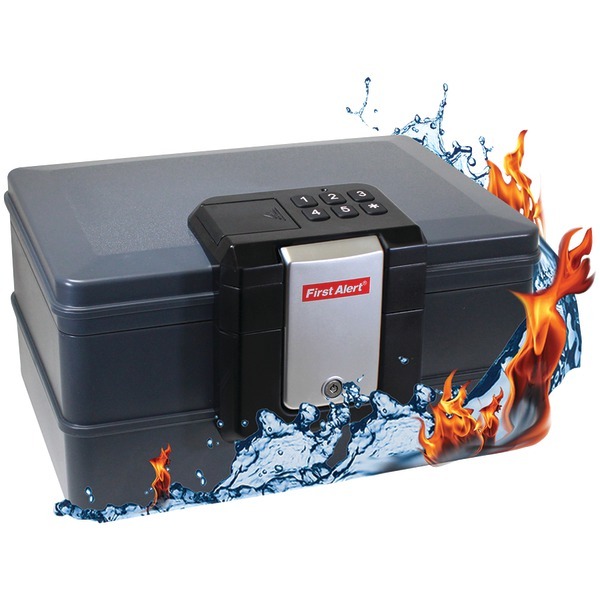 Fire rated for 30 minutes at 1200 degrees F with solid steel construction, the Jewelry Floor Safe is built to take a beating and protect your most valuable possessions. Program the electronic keypad with your own 6 digit combination. The electronic keypad also features a 5 minute time out with 3 incorrect code entries. Four, 1 inch locking bolts, 2 live and 2 dead, secure the 16 gauge steel body and door. Two pre-drilled anchor holes and the included bolt-down hardware kit round out the safety features. 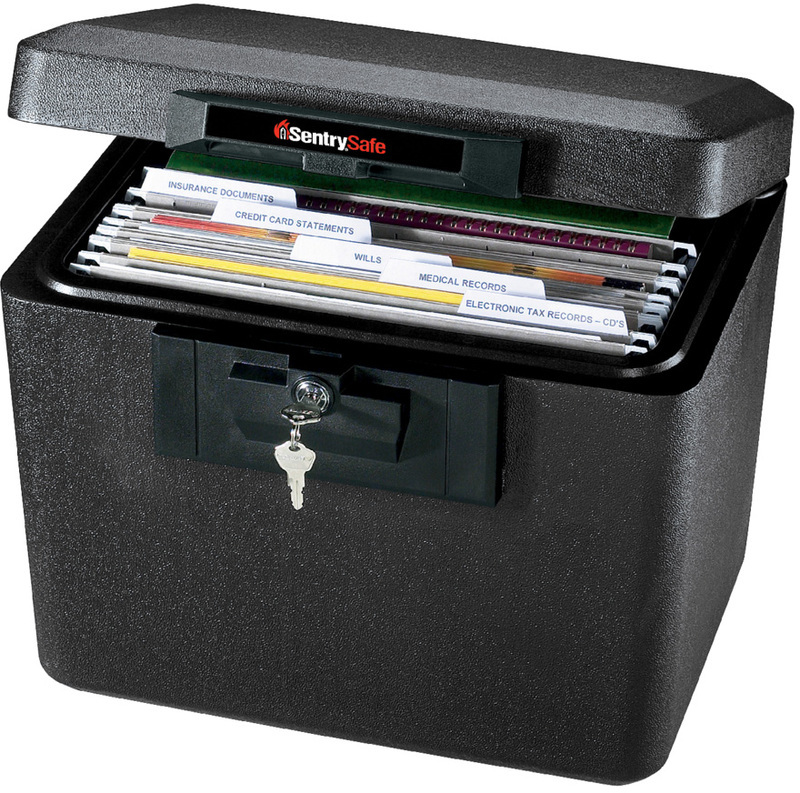 The Jewelry and Collectables Safe offers 3.32 cubic feet or storage space. The felt lined interior has several internal organizing features to help keep everything easy to find. 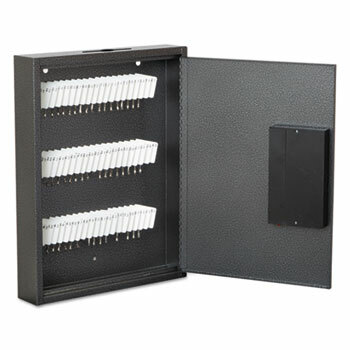 On the inside of the Electronic Valuables Safe a single internal shelf adjusts in 1/2 inch increments, and the removable drawer has 3 separate compartments. An additional organizer on the inside of the door has a zippered pouch for money, and 8 elastic straps for watches.